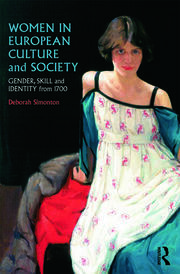 Deborah Simonton is a Fellow of the Royal Historical Society and she leads the Gender in the European Town Network. Her international reputation has led to invitations to act as an international expert reviewer for research grants, to act as a keynote speaker and to join panels on a range of topics. She is mainly interested in eighteenth-century issues of women and gender. Her central focus is on education and the economy, which led her to study apprenticeship and which has ultimately led to the work she currently doing on gender in the European town. She studies the gendered and power relations articulated in the shifting economic structures of corporate towns in the context of commercial and polite culture. She is interested in the language of skill, which drew heavily on the masculine traditions of urban guilds and apprenticeship, and she has explored how the urban community was masculinised, how women utilised a range of strategies to either conform or circumvent urban regulation; and how commercial trading shaped the ways that men and women established themselves in urban culture. She interested in understanding how women (and girls) negotiate their places and identities in the largely patriarchal society of the eighteenth century, what ‘materials’ and devices they used and how they circumvented restrictions, such as guild and corporation records. She has recently moved toward thinking about the physical and metaphorical spaces they occupied and how they positioned themselves within them. She believes the network on Gender in the European Town, and the discussions and shared research of colleagues from across Europe has been one of the most interesting and stimulating experiences of her ‘historical’ life.